Home » Celiac Disease » The TRUTH About Gluten-Free Food — Does it Help or Hurt Gut Health? The TRUTH About Gluten-Free Food — Does it Help or Hurt Gut Health? When I was diagnosed with Celiac disease in 2007, I had no idea what gluten-free food was. I’d never heard of it before and I definitely didn’t know where to buy it. The “gluten-free” food industry is making a TON of money, while conditions like Celiac disease and gluten sensitivity are trending on Twitter and gaining more awareness each year. Today, even the smallest grocery stores across America are beginning to carry gluten-free foods in a “healthy living” section, right next to the green tea. Gluten-Free foods are becoming ubiquitous and synonymous with living a healthy lifestyle… even for people without Celiac disease. But is gluten-free really healthy? Will it make Celiac disease and gluten intolerance a distant memory? There’s no denying the fact that people with Celiac disease or gluten sensitivity should avoid all gluten. Most Doctors tell them they’ll be fine if they follow a strict gluten-free diet. But how effective is the gluten-free diet for the people that need it most? Even after 16 months of eating gluten-free, they still had severe gut inflammation. Inflammation damages the intestinal lining in your gut and causes digestive problems. It can also damage the arteries in your heart and cause heart disease, and even damage your joints or cause rheumatoid arthritis. It also leads to just about every chronic disease we know of. So, it’s a pretty big deal that it’s not improving on a gluten-free diet. What about people without Celiac disease or gluten sensitivity that go gluten-free to lose weight or get more energy? Well, new research is beginning to suggest a gluten-free diet has harmful impacts to the good bacteria in our gut. Not only does the research indicate that going gluten-free doesn’t fix the gut or cool inflammation, but that it alters your gut flora and allows bad bacteria to grow in your gut. But what could possibly be wrong with a gluten-free diet? Doesn’t gluten cause Celiac disease? But there’s a laundry list of other foods that drive inflammation and keep the gut leaky. Don’t get me wrong, gluten is the worst offender. But a Celiac’s gut is severely damaged and highly susceptible to poor food choices. If you don’t remove the “other dietary triggers” contributing to the disease, you’re going to end up sick and pissed off like I was. Going gluten-free isn’t enough… and here’s why. Mainstream literature on Celiac disease tells us that eating gluten-free is a healthy lifestyle choice and doctors regularly explain it as the only way to treat newly diagnosed Celiac disease patients. But the treatment plan is dripping in the same conventional wisdom that created the current Standard American Diet (SAD). That’s the rub: the average gluten-free diet is built on the same foundation as the SAD… both are low-fat, highly processed diets made up of toxic foods. The biggest problem with the Gluten-Free Diet is the reliance on processed foods that are low in nutrients and high on toxins. Even though the worst offending food toxin, gluten, is removed – the Gluten-Free Diet relies heavily on the other four agents of modern disease to create a diet that “looks” very similar to the Standard American Diet. In fact, many types of gluten-free pasta and other packaged foods are loaded with higher concentrations of these 4 food toxins than their original counterparts. In “How Gluten Causes Celiac Disease,” I explained that the main reason we don’t eat wheat and other gluten-containing grains is that they contain a protein called gliadin, which is a prolamine that increases zonulin production causing leaky gut and inflammation. And remember when I said that plants carry weapons of mass destruction? It’s no joke… plants are concerned about their survival just like we are. They don’t want to die, which is why they have defense mechanisms to protect them, like toxic anti-nutrients and proteins that should deter any living being from eating them. Toxic prolamines give the plant a protection mechanism for their survival (since they can’t get up and run away). These proteins irritate the gut lining and sneak their way past the intestinal wall in humans and animals that eat them. But remember earlier when I made the point that a gluten-free diet leaves many Celiacs with inflammation, leaky gut, and nutrient deficiencies? Phytates are not for plant defense – they’re for self-fertilization of the plant. They’re specially designed to keep the plant supplied with the necessary vitamins and minerals it needs to stay alive. When we eat them, they bind to metal ions inside us, so they can impair the bioavailability of critical minerals like calcium, magnesium, iron, and zinc. (18) Not only that, but they inhibit the enzymes we need to properly digest foods and extract nutrients from them. It’s a 1-2 punch; they tend to steal the minerals we need and then rob us of the ability to properly extract nutrients from the foods we eat. Soy screws up your hormones because of the presence of phytoestrogens. This is important because these phytoestrogens are linked to cancer growth and infertility problems. Your hormones need to be working correctly to recover from illness. Soy increases the need for more vitamin D, which we already know contributes to leaky gut. For a complete listing of the toxic effects of Soy, check out this PDF from the Weston A. Price Foundation. Just like grains, soy contains toxic chemicals that don’t support recovering from Celiac disease. Simply put, there’s much better quality food to put in your mouth. Bottom line: Industrial seed oils promote inflammation by dramatically affecting your ratio of n-6 to n-3 fatty acids. Here’s 141 reasons why sugar ruins your health… but I want to focus on what it feeds. Carbohydrates and Sugars are the primary food for the bacteria in our gut. Bacteria live on sugar – that’s normal. What isn’t normal is the type of bacteria found overgrowing in the gut of a Celiac patient. Normally there’s a balance between good and bad bacteria. When the delicate gut flora balance gets upset, opportunistic or pathogenic bacteria can quickly take over and cause “Gut Dysbiosis” or small intestine bacterial overgrowth (SIBO). One reason Celiacs frequently have gut dysbiosis is a result of the damage to the villi of the small intestine. During the active stages of Celiac disease, the villi aren’t working properly and carbohydrate malabsportion can occur (meaning there’s suddenly a ton of extra food for the bacteria to feast on). The most common sugar consumed in the standard gluten-free diet is sucrose (or table sugar). Sucrose is made up of one glucose molecule and one fructose molecule bonded together to create a disaccharide (2 sugar molecules). Sucrose gets broken down by the digestive process into monosaccharide molecules to be absorbed by the gut. Here’s the catch: The main “splitter” for these chemical bonds is the micro-villi, which we just discussed are damaged and not able to do their job. This leaves us with a surplus of sugar molecules hanging around in the intestine feeding bad bacteria (Read this article for in-depth info on the different kinds of sugar). In a previous article I wrote, I pointed to the latest research suggesting that we can’t reverse the damage from Celiac disease without reversing leaky gut. So far, I’ve shown you how toxic defense mechanisms in gluten-free cereal grains create leaky gut and inflammation. How can SIBO cause so much trouble? Not only that, but while they happily feed on undigested sugars and other carbohydrates that are supposed to feed you, they release gases like hydrogen and methane. The end result is gas, bloating, and diarrhea or constipation… and perpetually untreated Celiac disease. Bottom line: If you have Celiac disease, you have leaky gut and bad gut flora. 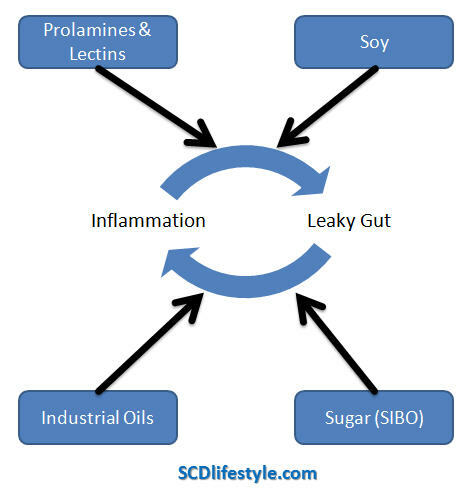 We’ve talked about how prolamines and lectins cause inflammation and leaky gut. We’ve talked about how SIBO causes inflammation and leaky gut… and all within the confines of a gluten-free diet. The only way to begin treating Celiac disease is to break this inflammation-leaky gut cycle… and the first step is to recognize that gluten-free isn’t enough. There’s a better way to eat that can begin to halt this process. So, What Can We Eat to Feel Better? The answer: Eat easy-to-digest, low-toxin, real foods – foods that don’’t feed bad bacteria or promote inflammation… but at the same time provide adequate nutrition and improve intestinal permeability. The majority of marketed “healthy gluten free food” is STILL processed junk food. Simply eliminating cereal grains that promote inflammation and leaky gut is a step in the right direction. But if you remove the other 3 toxic foods I mentioned above (soy, industrial seed oils, and sugar) you’ll be one step closer to recovery. At that point, you’ll be eating a whole food, non-processed diet – which is ideal for optimal health based on what we know. Is that the same thing as a Paleo or Primal diet? In our experience, a recovering Celiac does well to graduate to the full paleo/primal diet after focusing on healing the gut first. The recovery process starts by starving out the bad bacteria and helping the gut heal by removing normally healthy food that can be problematic. In general, the best results happened when foods are properly cooked and problematic foods are slowly introduced over time. Before the discovery of gluten in 1952, Dr Sidney V. Haas proposed the theory of SIBO as the cause of Celiac disease in his book The Management of Celiac Disease because he saw a benefit in treating Celiacs with The Specific Carbohydrate Diet (SCD). The SCD diet is a form of low-carb paleo/primal that removes common irritants that are problematic in the Gluten-Free Diet, but it also limits the availability of carbohydrates as a food source for bad bacteria and starves them out over time. As the small intestine improves, Celiacs can begin to properly absorb nutrients again. The volume of sugars that are allowed to ferment in the digestive tract becomes less and the symptoms of bloating, gas, and diarrhea start to go away. Lastly, the SCD framework starts out with simple foods that are easy to digest. Over time, you end up creating a custom diet that expands with more foods while you heal… eventually allowing foods that might not have been well tolerated earlier (like nightshades, eggs, nuts, or fermented dairy). The bottom line: SCD was the only thing that finally stopped my Celiac disease symptoms and started to reverse the damage to my body before I could even tolerate a paleo/primal diet. If you’re ready to take control of your Celiac disease, I highly recommend you try SCD for 30 days to see how you feel. P.S. 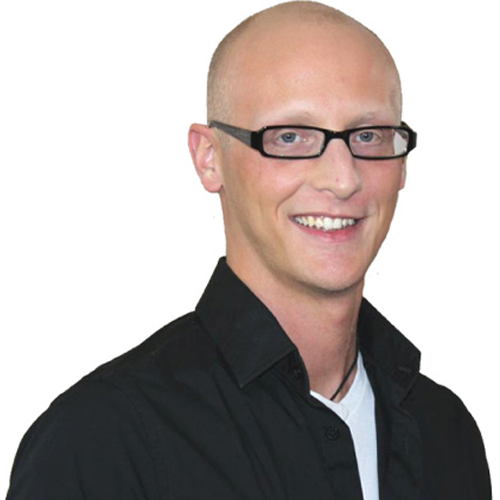 – Please share this with friends and family dealing with Celiac disease or gluten intolerance. Thank you. I have found near complete relief of my “symptoms” from being on low fodmap diet for the past yr., but have heavily relied on cereal grains as an everyday staple. So am I actually healing my gut at all?? I’m curious about what’s next for me. Is it possible to further heal my gut and one day be able to digest fructose? Should I consider the GAPS or SCD diets? I’ve read that these can truly heal the gut over a 1 to 2 yr period. I’ve found mild relief of symptoms (constipation, extreme gas, reflux & some joint pain) from 1yr on a gluten free diet and FULL relief from a low fodmap diet. I’m concerned that I rely heavily on other inflammatory grains (oats, rice,corn) as everyday staples? . I’m fully committed & feel compelled to healing my gut but don’t know where to start -SCD, GAPS, grain-free, even though my symptoms are gone. After your wonderful post, I’m scared that I’ve been over-consuming inflammatory grains/starches. I’m a wife & mother of 3 little boys (one of which I believe to have many symptoms of an imbalanced gut) -all of whom eat a ton! It’s so hard to feed them all. I feel lost & want to spare them of the leaky gut which I’ve acquired. Help! Good information. So true, the processed GF foods out there are totally unhealthy. This was a really great article. Been hearing a lot about CBD oil, any comments on this helping ? Hi Donna, thanks for commenting. Steve and Jordan haven’t used CBD oil themselves or with clients yet. Keep us up dated if they do ……if I decide to try , I will let you know how it goes. Great article, but wish it had gone a step further in linking the GMO factor, esp with regards to soy and sugar. Many still do not understand the role GMOs play with their health, so we need to get the word out more. Great point Wendy – I know Steve and Jordan are very interested in this topic and will be addressing it further in the future! Thanks for reading and for commenting 🙂 We’re so grateful to have you as a member of our community! Has this book been translated into other languages? I live in France and I know someone who is suffering from Celiac, has gone gluten free and still has several severe health problems. I would love to share this information with her but she doesn’t speak English! Hi Genevieve, thanks for asking! We have community members around the world, but our book hasn’t been professionally translated into any other languages. Since it’s online, however, you could use an online translator like Google Translate to translate the book, if you want. Thanks so much for your interest 🙂 I hope this can help your friend! Awsome article! It puts everything I’ve been hearing from you guys, Christina, Dr. Tom, ect in one place. Everything made since except one part!…..
“What about people without Celiac disease or gluten sensitivity that go gluten-free to lose weight or get more energy? (Like gluten-free granola, gluten-free cookies and bread, gluten-free pizza, etc.) you may actually be worse off than if you had continued eating typical gluten-containing foods. Lots of gluten-free foods are completely nutritionally empty and contain more sugar and industrial oils than their traditional gluten-containing counterparts. Going gluten-free is healthful so long as you replace those foods with other whole foods – fruits, vegetables, meats, and healthy fats 🙂 Jordan and Steve don’t recommend you eat any processed replacement “gluten-free” foods. Thanks for a great article. I had to find this out for myself the hard way, when I gave up gluten in 2011, but still had a bad reaction to other grains, such as rice, GF foods and vegetables! Recently I discovered the “zero carb” (ZC) diet and have never felt better and am finally able to lose that stubborn last 10 pounds! Awesome to hear you’re feeling better! I’ve been following and enjoying your posts for over a year now. What you say makes sense and works. Something I would like to see you address is serotonin. Do you get enough on the SCD? What about potatoes? Is that something a person can eventually eat? Hi Agnes – thanks for your question! Steve and Jordan believe most people can eventually graduate to a paleo/primal eating template (including potatoes and other dense sources of carbs) once they’ve healed their guts on a diet like SCD. SCD isn’t necessarily low-carb either – you can eat a lot of veggies and fruit while following the plan. You can tweak the diet to make it work for you. Hi I am just curious what do you think about buckwheat as I know it is a psudeo type of grain. Hi Pamela – thanks for asking! Steve and Jordan don’t recommend buckwheat either while you’re healing your gut on a protocol like SCD or for longterm health and wellness. I was diagnosed with mild SIBO two years ago and just told to eat a low fat, low carb diet. In addition was diagnosed with a Mast Cell disease. The latter made eating any food very difficult. I went from 3 foods that I tolerated to now 22 foods. I looked into the SCD diet list of foods just now and thankfully only 6 are not allowed. Hopefully I will see further improvement in inflammation in deleting them. Unfortunately mast cell disease is one of inflammation so I don’t know that I can ever be free of inflammation. I’ve been able to cut the number of medications that I’m on in half, but still have many health issues. Unfortunately in my area I know of no one of your caliber or Chris Kressor so I appreciate all the information the two of you are able to provide. I’m my own lab rat and so far have done fairly well. Thanks so much. Thank you Izzy! We really appreciate hearing from people like you who are having success with SCD 🙂 You’re on the right path, and we know your health is only going to continue to improve.